I respect and appreciate French cuisine—that’s a fact. It may be because French was the second language that I learned, or that I first watched Julie & Julia with my mom and we have even since shared a special love for Julia Child’s whimsical flare. Actually, maybe this factuation grew as I volunteered more and more at a culinary school founded by a Frenchman and based on French culinary techniques, or just simply because I enjoy French wine with French cheese and baguette. Who knows! Whatever the reason(s), exploring healthy baking recipes based on classic French creations and ingredients is always an extreme delight. I had a pack of puff pastry in the freezer, so I found a recipe, originally by Michel Richard, that called for using this pack as well as wholesome vegetables, fresh herbs, and some of my CSA bounty. Feel free to make your own puff pastry for this recipe, but I’ve learned from other trained chefs that using frozen puff pastry is nothing to be ashamed of if short on time, energy, or the interest to make it from scratch. I modified the recipe to clarify the directions and reduce some ingredients that have high saturated fat contents. 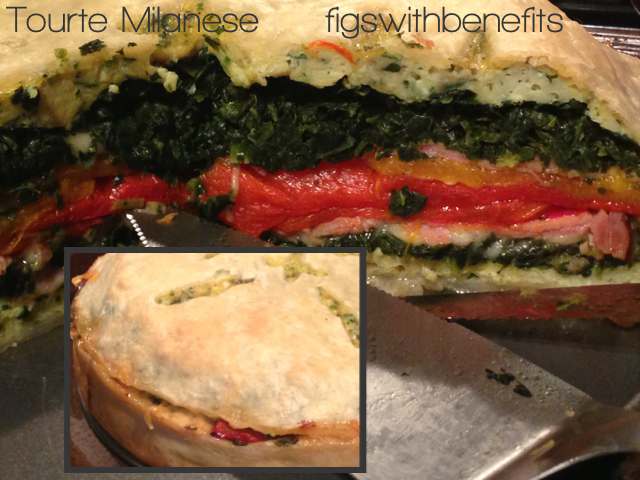 The vegetables used for this tourte are the perfect match to help promote an anti-inflammatory diet. Red bell peppers are rich in Vitamin C, making these peppers one of the best sources for this essential nutrient. The antioxidant properties and flavonoids in such foods help protect the body from free radicals, a result that has anti-inflammatory benefits. 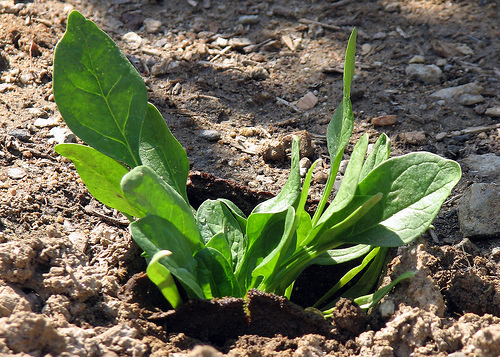 A plant showing dark green colors are also packed with Vitamin C. So red bell peppers, meet spinach. Spinach is an excellent source of Vitamin C as well, and has several flavonoids to battle inflammation. Furthermore, research shows that spinach leaves contain glycoglycerolipids, which helps protect the digestive tract from unwanted inflammation. In the tourte, we are also minimizing omega-6 oils and saturated fats while adding herbs to assist the vegetable couple in providing anti-inflammatory benefits! Generously butter an 8 1/2-inch springform pan. Cut off one quarter of the pastry, cover, and set in the fridge. 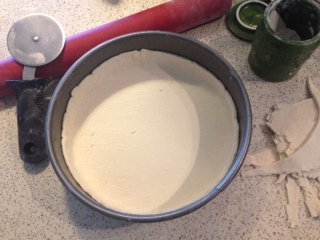 Roll out remaining puff pastry on a lightly floured work surface to a 1/4-inch thick round. Carefully fit the pastry into the pan, pressing to get a smooth fit, nearly reaching the top of the pan around the edges. Place pan in fridge and take out the small piece of pastry that was already placed inside the fridge. Roll out the smaller piece of pastry until it is 1/4 inch thick. Cut out an 8-inch circle of dough for the top of the tourte and lift it onto a plate or baking sheet. Cover both the lid with plastic wrap and leave in the fridge while you prepare the filling. Save the scraps and put them in the freezer! Take out for another use by thawing in the fridge, sprinkling with grated, sharp cheese for a savory pastry or cinnamon and sugar for a sweet pastry, shape into a twist or other shape, and bake. An easy way to quickly make a crispy, simple treat! Whisk eggs, herbs, salt and pepper together. Melt the butter in a large skillet over low heat and pour in the eggs. Gently but constantly stir the eggs around in the pan, pulling the eggs that set into the center of the pan. Slide the eggs onto a plate, without mounding them, and cover immediately with plastic wrap. 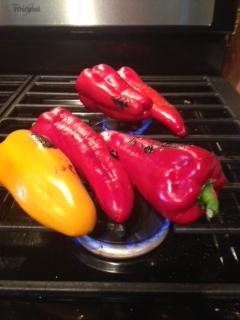 Peppers: place whole and untrimmed, directly over the flame of a gas burner. 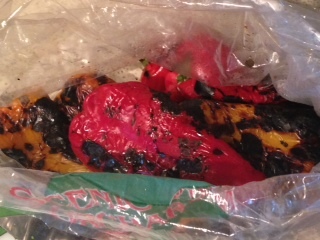 As soon as one portion of a peppers skin is charred, turn the pepper. When black and blistered all over, place in a plastic bag and seal. After about 15 minutes, once cool, use your fingers to rub off skin. Cut each pepper once from top to bottom, cut away the stem, open the peppers, and lay them flat. Trim away the inside veins and discard the seeds; season peppers with salt and pepper. Cut flat peppers into thirds, and set aside, covered, until needed. Spinach: cook in a large quantity of boiling salted water for 1 minute to blanch it. Drain spinach in a colander, rinse with cold water, and press it to extract all of the excess moisture (you may need to allow it to cool for a few minutes if still to hot for your hands). Heat the oil, butter, and garlic in a large frying pan over medium heat. Add blanched spinach and sauté for 3 minutes. Season with salt, pepper, and nutmeg, and add a little whipping cream. Bring quickly to the boil and stir so it mixes with the spinach. Remove the spinach from the skillet with a slotted and set aside. Position a rack in the lower third of the oven and preheat oven to 350°F. Remove the pastry-lined springform pan from the fridge and layer the filling ingredients in the following order: half the eggs, half the spinach, half the cheese, half the ham, and all the roasted peppers, laid flat. Continue layering in reverse order—ham, cheese, spinach, and eggs. With each layer, make certain that the ingredients are spread to the edge of the pan. Fold the excess crust in over the filling, and brush the rim of crust you’ve created with the egg wash. Center the rolled-out top crust over the tourte and gently push the edge of the top crust down into the pan, pressing and sealing the top and bottom crusts along the sides. Brush the top with the egg wash and cut a vent in the center of the crust. Use the point of the knife to etch a design in the top crust, taking care to cut only halfway into the dough. Chill the fully loaded tourte for 30 minutes to 1 hour before baking. Place the tourte on a rimmed baking pan, give it another coat of egg wash, and bake it for 1 hour 10 minutes, or until puffed and deeply golden. Remove from the oven and let rest on a rack until it reaches room temperature. Run a blunt knife around the edges of the pan and release the sides. Notice how we’re using salt and pepper at each step in the dish. In order to properly season your food, practice seasoning as you cook for best results. You usually end up using less salt all together, as cooking with salt distributes its effects better than sprinkling on top of your food later. Taste as you cook, too, adjusting according to your tastes. Once finished, the first cut into this pie will make your elbows flap and toes wiggle, seeing the vibrantly colored layers that pay homage to Italy’s flag (shhh, don’t tell France). Bon ap, to anti-inflammation!